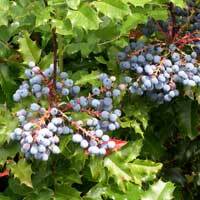 Adapted to dry, open, more rocky hatitats, the Tall Oregon grape has fewer leaflets (5-9) than its cousin, Low Oregon Grape (9-19). It also handles shade and moisture as well. More rugged in appearance, it is looks best planted with shorter plants around it. The holly-like leaves make it an excellent barrier hedge. This plant grows by spreading from underground roots. Bright yellow clustered flowers followed by purple fruits. Blooms in spring.